Why Is California’s Efficiency Program Struggling to Gain Traction? The state has achieved only one-tenth of its efficiency retrofit goals so far. After spending more than $230 million on a wide-reaching efficiency program over the last three years, California has only reached a fraction of its retrofit goals -- spending more on administrative costs than on actual projects. 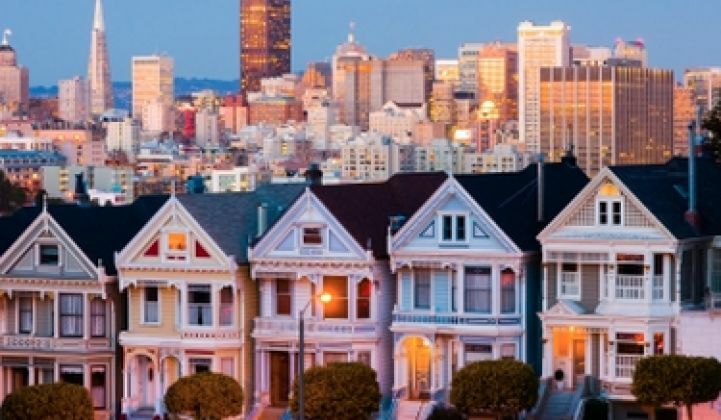 According to an analysis of state data by the San Francisco Chronicle, California has only supported 12,200 home efficiency retrofits under its Energy Upgrade California program since 2011. The stated goal of the program is to service over 100,000 homes. The slow start raises questions about the way California rewards contractors and homeowners for efficiency upgrades. Energy Upgrade California is a partnership between the state's two energy regulatory agencies, utilities and local governments designed to provide a streamlined process for homeowners and contractors to implement efficiency retrofits. It was designed to offer a one-stop shop for efficiency incentives similar to California's successful solar initiative. Early on, the program was boosted by $146 million in stimulus funds. The California Energy Commission initially reported that $1.2 billion in funding would be leveraged for retrofits, while also expanding reach into the commercial sector. But the expected boom in projects hasn't occurred. The problem, say some contractors, is that Energy Upgrade California is nothing like the state's performance-based solar initiative. Rather than tracking actual energy reductions, the program relies on complicated modeling that contractors say increases overhead costs and limits the number of jobs they can undertake. "The process has been micromanaged," said Ori Skloot, co-founder of Advanced Home Energy, one of the largest contractors in California. "Rather than just make it an open market where we reward real energy reductions, it's all based on theoretical savings. There's a lot of verification paperwork and cost to contractors." Skloot, who is also executive director of the trade association Efficiency First California, said that the high cost of working within the program has limited industry participation. He also said it has created a "race to the bottom" among some contractors, who are simply replacing equipment for the sake of easy rebates and not working with homeowners to achieve the deepest savings possible. Ironically, the modeling used by Energy Upgrade California was set up to prevent contractors from gaming the system. The required software, called EnergyPro, calculates the impact of various retrofit scenarios for a home or business. Contractors must use EnergyPro to model a project and get their calculations verified before securing rebates. But the process is time-intensive, said Skloot. "Working through the program can take up to 25 percent of our time on a project," said Skloot. "There's a high cost to that. And so for some contractors, it's much easier to go for the lower-hanging fruit rather than doing the harder work." The San Francisco Chronicle corroborated the experience described by Skloot when it reported that most of the money has been spent on program implementation and marketing, rather than retrofits. In 2013, the Public Utilities Commission reported 3,917 projects completed, according to the Chronicle. That was down from 5,627 in 2012. With such a high degree of spending and results far below expectations, some are asking how the efficiency industry and regulators can make changes going forward. The rough start to Energy Upgrade California was caused by a variety of factors put into play simultaneously. The hangover from the housing crisis prevented many homeowners from investing in efficiency and made banks more hesitant to lend. And even in California, the leader in efficiency, many people are still unaware of rebates. As a result, much of the program spending went toward marketing to raise awareness. But some industry onlookers warn that program implementation is the biggest factor to blame. "Although the program is an excellent foundation, the problems have come because they're not setting up a real market," said Skloot. "It was unintentionally hobbled. We need to pivot." The Energy Upgrade California program made important changes to the previous incentive system, which provided payments based on individual items installed in a home. Those rebates did little to reward savings, so administrators put in place a modeling system that incentivized contractors to think about retrofits holistically. The next step, say reform advocates, would be to tie rebates to real energy savings, not a complicated model. That would mean making efficiency a "monetized commodity" based on metering data that utilities would procure like any other supply-side resource. "When programs, and ultimately the market, begin rewarding performance and results, industry will be freed to innovate around how services are delivered, while setting up a virtuous cycle that allows the market to select for those business models that provide what customers want to buy, profitably deliver customer value, and produce real savings," said Skloot. Matt Golden, an energy efficiency expert who works in the California market, wrote about the importance of turning efficiency "programs" into "markets" for Greentech Media last September. "The simplest answer is usually the right one. We need to start measuring the results of our work in a way that is transparent and that creates real accountability, and we need to simply measure the necessary public investment to harvest the resource. It is time to start comparing apples to apples -- public or ratepayer dollars against savings at the meter." Advocates of change are quick to laud the California Energy Commission and the Public Utilities Commission for attempting to build a more robust efficiency sector. But they argue that the slow start to Energy Upgrade California is proof that changes are needed in order to lower transaction costs for contractors, reduce administrative overhead, and encourage the industry to focus on tangible savings. "Efficiency works and creates real value. But we need to reward actual energy reductions," said Skloot. "I hope this is the kick that brings some change to the program."